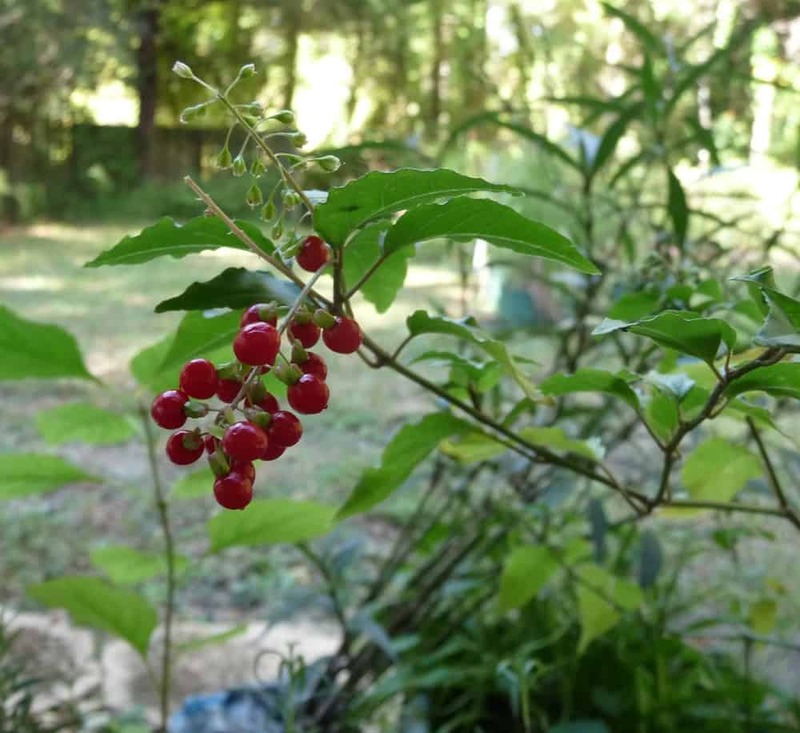 Rouge plant, Rivina humilis, is a small, perennial, shrub native to Arkansas, Arizona, Florida, Hawaii, Louisiana, New Mexico, Oklahoma, and Texas. It is in the Phytolaccaceae, or pokeweed, family. 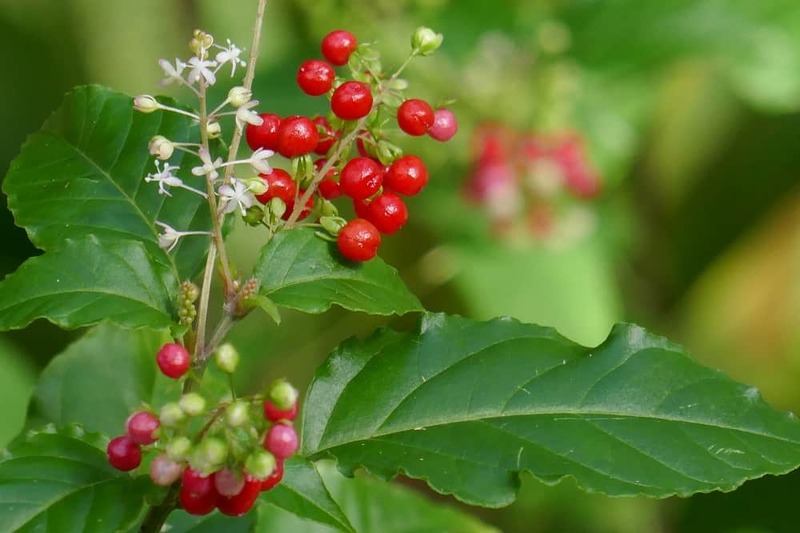 Other common names include bloodberry, pigeon berry and coral berry. It grows to about three feet in height and can be found growing in woodlands, hammocks, and disturbed sites. In the home landscape it grows in the partial shade underneath trees. The leaves are a deep green with crinkled edges (the leaf margins). Leaf size varies from about 1 to 6 inches in length. 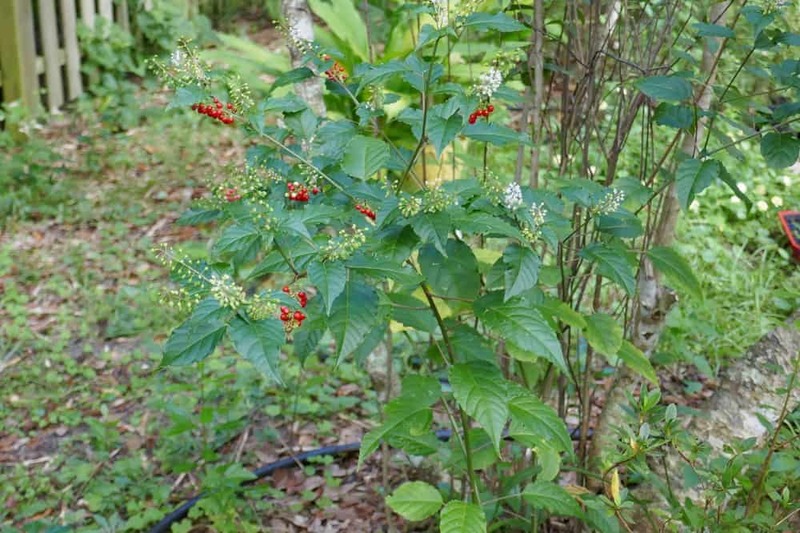 The leaves grow alternately on the plant and are lanceolate in shape. In Florida the small, white to pale pink, flowers appear in the spring, summer, and fall. The flowers themselves are about 1/8th of an inch long and are born along racemes that are about 3 inches in length. 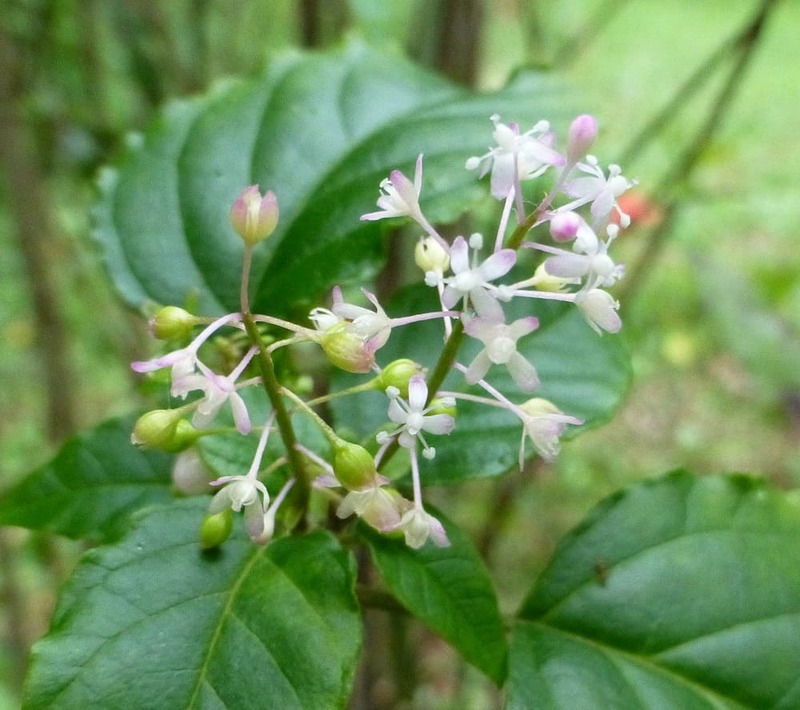 The flowers are stalked along the raceme. The flowers are used as a nectar source for small insects and bees. The fruit appear on the plant during flowering. The berries are small, round, and bright red. They add a lot of color to the landscape. I have several rouge plants growing in pots on my deck and the flowers and fruit end up hanging over, and on, my deck hand rail. Throughout the day the Northern cardinals come and eat the flowers, and ripe berries, that they can reach from the railing. In the home landscape it grows in part shade with dry to average moisture. Rouge plant can be grown in zones 7a to 10b. The blooms and berries appear continuously and one does not have to dead head it to keep the flowers blooming. It is completely maintenance free once established. It is not salt tolerant. I like to grow them in pots on my porch where most plants are difficult to grow because of the lack of sunlight. Propagation is achieved through seeds and transplanting. When collecting the berries, with the intent of saving seeds, one should always make sure the berry is completely ripe. If the berries are a deep red and easily come off of the plant they are ripe. Avoid the under ripe, pink, berries for seed saving as the fruit has not matured enough and may not be viable. I find it easiest to clean the fruit when it is fresh because once dried the pulp sticks heartily to the seed fur making it more difficult to remove. Buy rouge plant seeds at my eBay store … click here. 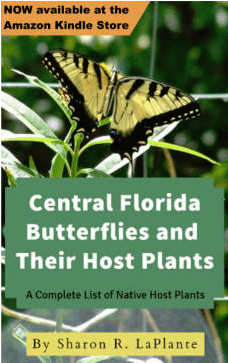 My new book contains a complete list of butterfly host and nector plants! Both ebook and print editions are available at Amazon.com!